I’ve been waiting for a site just like this. So far all of the content is great! I’ll be checking every day for more cool stuff. I’ve recently been moving from cast iron to multiclad. I just got tired of the poor heat conduction. Not much of an issue with as 12″ pan on a commercial range, and also probably not much of an issue on an electric burner, but over a residential gas stove, with burners around 3.5″ across you definitely get a hotspot wherever the burner is. Not a problem with a multiclad (nor, probably with aluminum or teflon lined aluminum, but I won’t use those for other reasons.) Not having to keep moving the pan around over the burner to spread heat is pretty nice. So… the next time you have a non-contact thermometer, plus 12″ CI pan on a residential burner, just have a look, and maybe stop mentioning CI’s great heat diffusion – because it’s not actually all that great. I agree with you that multiclad is fantastic, but I also think that cast iron has great conduction properties. 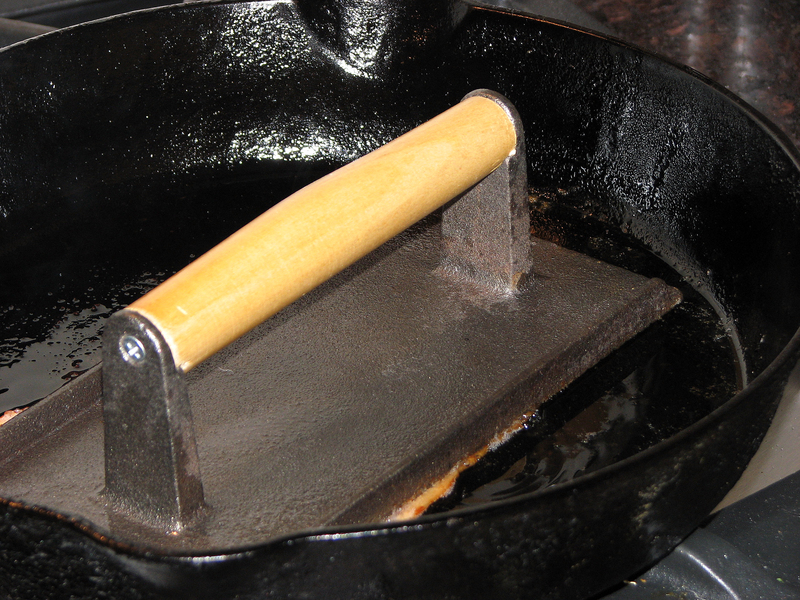 Since cast iron is a very slow conductor of heat and it takes a while for the heat to spread, it will form hot spots if it’s heated too quickly. Try heating it up more slowly over lower heat and I think you might see that hot spots just disappear. Thanks for your comment..
Well, for me, slow conduction == poor. A major point of cooking with gas is the immediate response you get when changing the flame. FWIW, I live in a cohousing community, we have a commercial gas stove in the commonhouse that I use on a moderately regular basis. Even with a much larger Lodge pan (18″? ), the effect is much less pronounced (big Vulcan – gas burners are 6″+ in diameter) but it’s still there. That would be with a low-and-steady flame and plenty of pre-heat time (browning a pan full of stuff, items at the edges get a lot less browned). Pan’s heavy to move and it’s got a ridge molded in the bottom to keep it centered, so you have to actually lift it to move it off center. OTOH, that hotspot can be a feature, when making, say fried rice; just keep moving stuff into and out of that center area. Same deal as a wok, but you can do a lot more bulk.